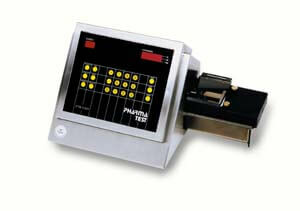 To test Hardness of any solid sample up to 300 or alternatively 500 N (Newton) the PTB111E is designed for. The PTB111E is equipped with a COM port for data transfer and a Pinter port to record the results. The test result is immediately displayed at the LED Display of the unit. It offers load cell adjustment and 3-point calibration menus. Depending on the tablet hardness you can manually test between 5 to 8 samples per minute. The user has to enter a nominal hardness and push the START key. When all data have been collected simply push the STOP key and get the results including statistical information printed at the attached Printer. The Auto-Restart option allows a faster test and higher throughput of samples compared with a manual Start procedure. The PT-MT3 Magnetic Tablet, is the successor of the PT-MT2 used to qualify and calibrate correct hardness detection and force/speed increase rate of most Hardness Test Instruments, like PTB 311E/511E, PTB 411/411-500, PTB 301/302/501/502/320, PTBA211E, WHT and WHTME, 4M, 8M series. Similar to the breaking behaviour of a tablet or ampoule the test jaw “breaks” when a selected force is applied to the test handle in which a calibrated load cell is placed. Any test range can be selected within the range of 10 to 500N.